Porcelain veneers are ultra-thin, custom-made facings that are affixed to your teeth. The dental veneers procedure is simple and comfortable and may take as few as two appointments. Made from porcelain, veneers are a great way to improve the look of your front teeth. 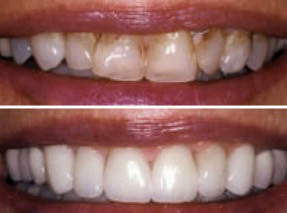 You can whiten your teeth, close spaces, and create a great smile easily and affordably. They may be used to correct small gaps between the front teeth, or to fix teeth that are poorly shaped or slightly crooked. We may recommend veneers to cover teeth that are chipped, worn or eroded. If you are concerned about the size, shape, position or color of your teeth, contact us today to setup a consultation.